We are provide Creating a niche of Turck Industrial Connection such as Actuator/sensor Connection Technology, RFID Cable and Field Bus Cable at its best, with utmost quality. We are offering RFID Cable. We provide premoulded BL ident connection cables for safe communication between interface and read/write head. They are optimally adapted to the individual components and thus guarantee safe operation of the entire system. The standard cable (/S2500) is perfectly suited for demanding applications. The Economy version (S2503) convinces through a good price/performance ratio and is suited for demanding applications. TURCK also offers the adequate connection cable (FB-) for rough ambient conditions. Protection class IP69K is achieved with read/write heads of the Wash Down series. RFID solutions are thus employable in applications of the food industry. Premoulded bus and supply cables from TURCK reduce the risk of wiring errors. For more information see connection technology. 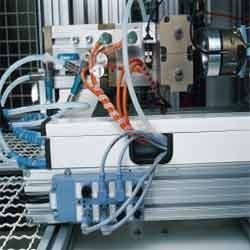 We are offering Actuator Connection Technology. Turck offers solutions for all requirements of rough industrial environments with a comprehensive program of connection technology products, comprising standard and customized components. You find female and male connectors, female and male flanges, customizable female and male connectors as well as extension cables, 4 and 8-fold junctions, Y and block. The connection cables are available in the standard sizes of 2, 5 and 10 m. The extension cables are available in the standard sizes of 0.3 m, 0.6 m, 1 m, 2 m and 5 m. Customizable types complement the product range, allowing you to use them with your own cables. 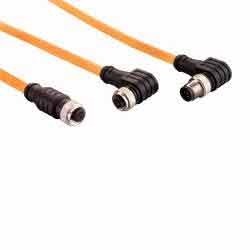 There is a connector available for every pluggable Turck sensor. Junctions of the types:M8 x 1, Ø 8 mm, M12 x 1, M16 x 0.75, M23 x 1,1/2‘‘ and 7/8‘‘.